How to go to Cappadocia from Istanbul? As we always say, Cappadocia Turkey is the second most visited tourist spot of Turkey following Istanbul as its known as the motherland of Hot Air Balloons Cappadocia for thrill-seeker as well as many other offerings such as hiking, horse riding, ATV Quad Bikes and much more! However its easier to participate our 2 days Cappadocia tours from Istanbul but you can also make the hotel bookings and travel arrangements on your own and enjoy this mysterious land free guided however its wide spread to 270 square kilometers and not easy at all. If you are travelling on a budget, then we can suggest you to travel from Istanbul by a night long bus ride about 12 hours to Goreme. This is tiring way of travel but comfortable Turkish intercity buses makes it a bit easier with domestic flight a like reclining seats to sleep a while. Your arrival will be early in the morning and you may also witness the balloons in the air if they are permitted to fly that day. They other option is travel by plane. There are two major airports where you can fly to: Nevsehir or Kayseri. Nevsehir airport is bit more closer to the region. If you are intending to stay one night and explore in 2 days, then book a flight early in the morning to make the most of your stay in 2 full days in the region. Roundtrip flights are around 90-110 USD per person by Turkish Airlines. The hotel that you will stay in Cappadocia would be happy to help you for airport transfer to the hotel. If not, you can also apply to transferman in the airport to participate in their shuttle services. Taking a taxi from airport would be a bit expensive as they distance is around 60-75 km in total to Goreme or Urgup towns. 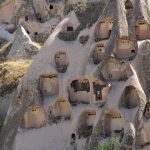 For further details about what to do in Cappadocia or where to see in Cappadocia you can take a look at our other blog posts. 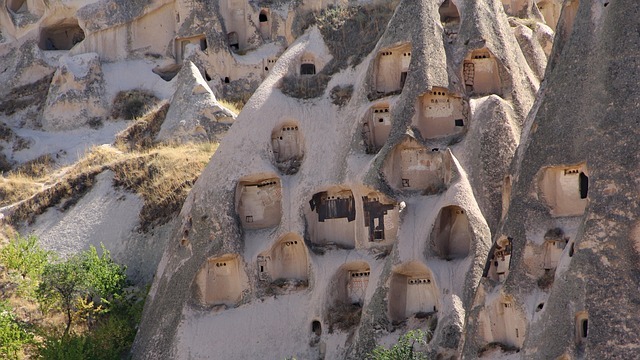 Cappadocia Turkey with its peculiar capricious and rocky formations and the architectural inheritance from the remains of millenarian cultures have given shape to a landscape that you will hardly find anywhere else in the world. Hittites, Assyrians, Persians, Greeks, Romans, Byzantines and Turks have left their mark and Cappadocia was declared a World Heritage Site by UNESCO in 1985. It is highly possible that when talking about Turkish travels while you are chatting with your friends, the image of hot air balloons flying over unique rock formations with festiveness comes to mind , without a doubt Cappadocia in Turkey is one of the best places in the world to fly in a hot air balloons. Attractions go far beyond the experience to get carried away by the wind and, once there, it would be unforgivable not to spend two or three days more to know what is hidden on the other side of the rocks in the undergrounds. 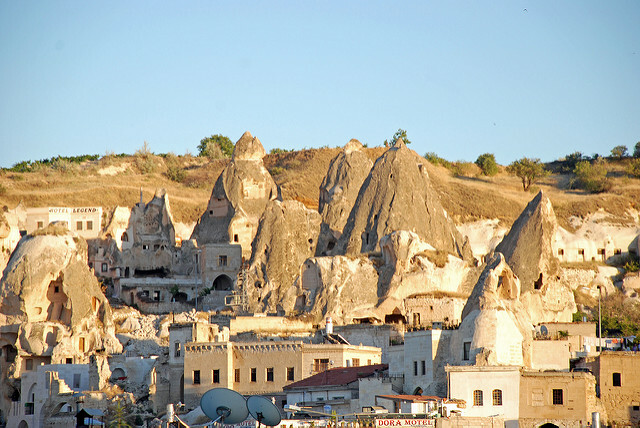 Fairy chimneys are the most famous postcards of the amazing geography of Cappadocia. Located in the center of Turkey, Cappadocia is a region of just over 200 square kilometers that is characterized by having a geological profile comparable to that of lunar landscapes, with shapes capriciously carved by the erosive forces for several million years. The majority of tourists visiting Cappadocia with the dream of flying in a balloon. The number of people who want to enjoy the flight is incredible and that is why it is almost always necessary to book well in advance, there are several companies that organize the hot air balloon tours cappadocia. In the low seasons during the winter, you can reserve a couple of days back and maybe one day before. But in the high season it is necessary to ensure trip booking weeks or months in advance. Both the fairy chimneys and the great majority of the rock formations of the region are made up of calcareous tuff, which is a very moldable stone. This allowed not only the work of erosion but also of man, who has built his dwellings in these rocks for centuries, digging them and creating artificial caves. The absence of wood in the area favored the almost exclusive use of these rocks as housing for the different civilizations that inhabited here. And so they reconverted these formations in the buildings, temples, towers and fortifications that were an essential part of their cities. The Göreme open-air museum can be reached on foot from Goreme town itself and we recommend it to be one of your first visits. It is a closed enclosure in which several Christian monastic complexes excavated in the rock are concentrated, many of them with frescos in their interior of the XI and XII centuries in excellent state of conservation. The churches of Santa Barbara, the Apple, the Serpent, the Dark, the Carikli or the Buckle are some of those that you can not miss, the magnificent state of their paintings make them the best in all of Cappadocia. Please contact as early as you can as last minute reservations can not be confirmed due to unavalability sometimes even one month before tour date. Come and Explore the region with Us. Copyright © 2019 Cappadocia Balloon Tours. All rights reserved.